Mort'ton, a strange and desolate place deep in the Mort Myre Swamp of cursed Morytania, is for most people only a city they quickly traverse to reach the Barrows. Still, Mort'ton has plenty of interesting places and rewards to reap for those who are willing and brave enough to investigate the city. However, Mort'ton is only reachable for those who have completed Priest in Periland started Nature Spirit. There are 2 routes to get to Mort'ton. The first is the 'traditional' route through Mort Myre Swamp. 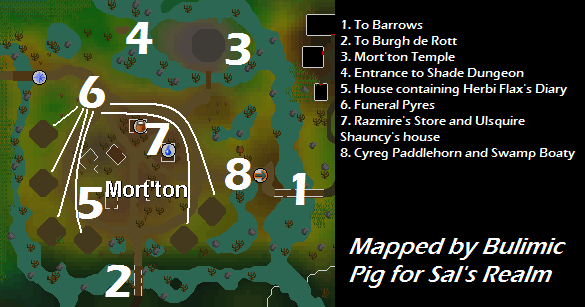 If you want to go to Mort'ton for the first time, you must take this route. This route is also the most dangerous one. Players who decide to take this route should remember to take their Blessed sickle and Druid pouch, because the Swamp is filled with Ghasts who will rotten your food or even hurt you. This is the yellow route on the map. 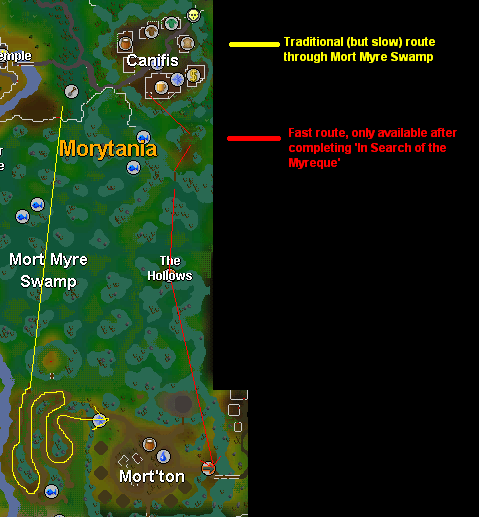 For those adventurers who completed In Search of the Myreque, there is a much faster and much safer route available. They can go through the Canifis Bar Basement (entrance behind the Bar) and surface into the swamp at the (old) Myreque hideout, then cross the bridge, head south and take the Swamp Boaty to reach the city. I strongly recommend this route, since it is a lot safer and also a lot faster (this route is also preferred by Barrowers). This is the red route on the map. Any adventurer going to Mort'ton must be able to overcome a feeling of loneliness. The city of Mort'ton is unlike any other city. Shades roam free and the citizens of Mort'ton have fallen ill. It is a strange disease that turns them into Afflicted and makes them talk complete gibberish. Players discover the only known cure, Serum 207, during Shades of Mort'ton. 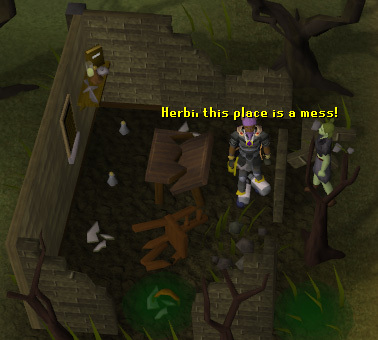 Check the Herblore Guide for info on how to make Serum 207. After completing Shades of Mort'ton, the player is able to use Serum 207 on the Afflicted villagers of Mort'ton. This will temporarily cure them and they will give you a gift as a reward for curing them. These gifts are always gifts the player can use in and around Mort'ton, like Coins, Swamp paste, unidentified Tarromin, Olive oil and empty Vials. The player can also make a permanent cure called Serum 208. This will permanently cure any Afflicted. Using Serum 208 on an Afflicted villager will result in you receiving bigger gifts (you won't receive different items though, only bigger quantities). Serum 208 is made by using a Serum 207 on the Holy Fire in the rebuilt Mort'ton Temple (for a completely rebuilt temple, go to World 2. It is usually completely rebuilt there). The Mort'ton temple was once an impressive structure that housed the holy fire. Now, it is merely a shadow of its former glory. Players can choose to repair the temple, this is also an important part of acquiring Fine cloth to make Splitbark Armour. 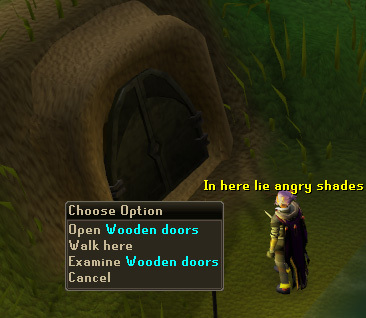 These big wooden doors are the entrance to the Shade Dungeon. 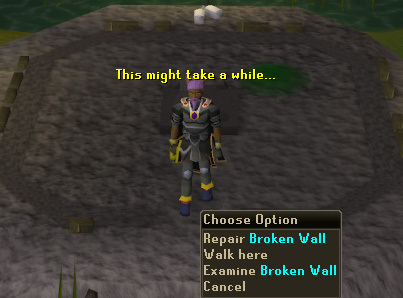 This Dungeon is the only place in Runescape where Fine cloth can be found for making Splitbark Armor. You need a Key to unlock the doors. Again, check the Splitbark Armor Guide to learn how to acquire these Keys. This is the house where you can find Herbi Flax's diary, which you need to start Shades of Mort'ton. There are also 2 Vial and 3 Smashed glass respawns. 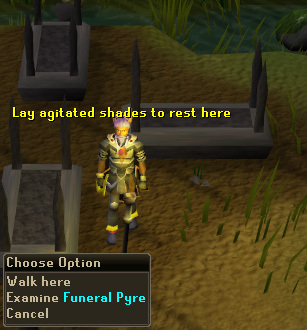 These funeral pyres are the places where you burn the shade remains for firemaking exp. By burning the shade remains on the pyres, you also acquire said Key that is needed to unlock the Shade Dungeon doors. Please read the Shades of Mort'ton Activity guide for further info. If you use a Serum 207 on him, you will (temporarily) cure him. That way you also unlock his shop. For continued access to the shop, you should use a Serum 208 on him. Razmire has 2 shops: a General Store and a Builders Store. The general store carries two very important items for those who want to gather Fine Cloth; Olive oil and a Flamtaer hammer. The Builders Store sells all the supplies that you need in order to repair Mort'ton Temple. Ulsquire Shauncy plays a vital role in Shades of Mort'ton, but otherwise he is of little importance. His house contains the only watersource in the city. 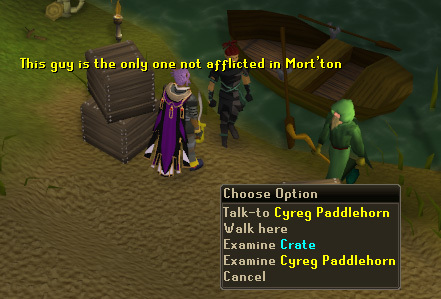 Cyreg is the only person in Mort'ton who hasn't fallen ill. He plays an important part in In Search of the Myreque and after completing the quest, you can rent his Swamp Boaty to take a quick route into the Hollows for 10 Coins.